Lately we have received several inquiries about veteran’s funerals and veteran’s death benefits. The following are some the benefits that the government provides to the families of veterans who have died. All that is usually needed to obtain these benefits is a copy of the veteran’s DD-214 (Discharge Papers) and/or a certified copy of his/her death certificate. 1. An American Flag which may be used (if desired) as part of the funeral service. 2. A grave marker — either flat bronze, flat granite, upright marble, flat marble or bronze niche. The flat bronze marker is most commonly used because it can be used as a foot marker (flush with the ground) or installed on the back of an existing cemetery monument. 3. A military service which usually consists of folding of the flag and presenting it to the family; playing of Taps; and sometimes a firing squad salute. 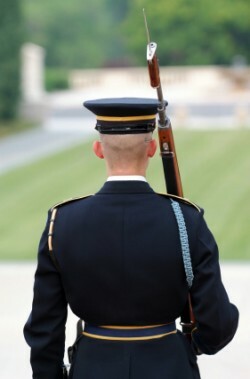 Although a military service is usually performed at the cemetery, it may also be performed at the funeral home or church. In years past, local organizations such as the American Legion or VFW provided these services, but in recent years Military Forces Honor Guard, which are men and women currently serving in the military, usually provide these services. 4. Burial in a Veteran’s Cemetery — Any veteran may be buried in a veteran’s cemetery. The closest to Hornell is the Bath National Cemetery in Bath, NY. If a veteran is buried in a veteran’s cemetery, he or she is entitled to a free grave, free grave opening (digging the grave), and a free concrete grave liner. A grave marker will automatically be installed at a later date. If the veteran was cremated, he or she will receive the same benefits with the exception of the grave liner. Also, it should be noted that if the veteran was married, the spouse can also be buried at the cemetery and is entitled to the same benefits as the veteran. 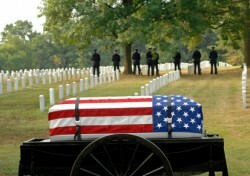 There is no time limit as to burying the cremated ashes of the veteran. Even if death & cremation occurred many years earlier, the ashes can still be buried at the VA Cemetery with Military Services. 5. Financial Burial Allowance — The veteran may be eligible for a financial burial allowance if he or she meets certain criteria. Some of the criteria are as follows: if the veteran died in a Veteran’s Hospital; if the veteran died of a service related illness or injury; or if the veteran was receiving a VA pension. All of the services that I have mentioned can be arranged by the staff at the Dagon Funeral Home. We are extremely knowledgeable and are willing to help families with any and all veteran’s benefits and/or military funerals.